One group that has assumed undue prominence in Nigeria due to persistent media coverage is the Nigeria Governors’ Forum (NGF). 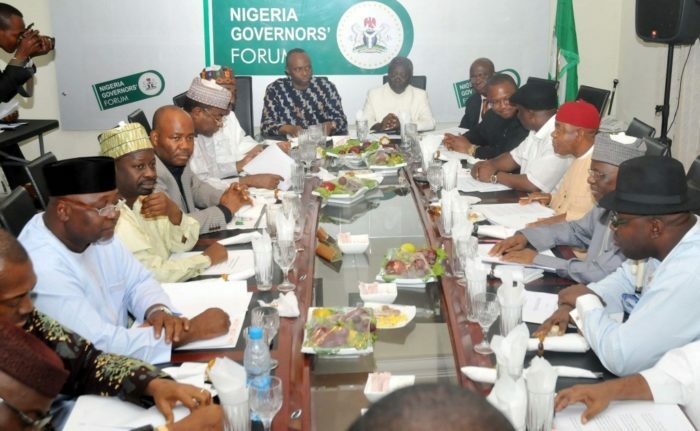 The forum comprising the thirty-six governors has consistently worked against the overall development of the country despite displaying a different posture. The NGF which is expected to be a conclave of thinkers that should proffer solution to the challenges plaguing the nation and its citizenry has now become an Augean stable that needs to be cleaned for the betterment of all. Last week, the NGF in a meeting in Abuja, the nation’s capital, resolved that it would sue the Economic and Financial Crimes Commission (EFCC) for its decision to embark on a probe of states for their usage of the unconstitutional, security vote. The EFCC’s decision to engender transparency and accountability irked the governors. And the reason is not far-fetched. Some of them may be unable to properly account for the funds and they fear that a probe of any kind will unearth their misdeeds. This is not the first time the governors will be resisting a probe from the anti-graft agency. The Forum also kicked against the probe of the Paris Club refund after many of them were accused of allegedly diverting the money. At the meeting, the NGF also took a swipe at those criticising the inability of state Governors to pay salaries and pensions including those that are yet to implement the 19,800 minimum wage. According to them, they were not elected just to pay salaries. This distasteful and insensitive comment from the group shows there are no better days ahead for Nigerian workers. At the moment about 27 states in the country have backlogs of either salaries or pensions which they are yet to fulfil but the governors are unconcerned. If they feel they are bigger than paying salaries, then maybe its time they left the position for those who will.